Tracy Lee Stum is kind of a badass. The 3D-chalk artist has been creating temporary street art for years, but this time around she has been commissioned by the Life of Pi crew to create art to raise awareness for Ang Lee’s film’s Blu-ray and DVD release. There’s no better way to do this than to recreate one of the epic moments in the film, when a whale visits Pi and Richard Parker in the middle of the night (as seen on the 3D Blu-ray cover art). Strum’s 3D chalk art is on display in LA Live until March 16. 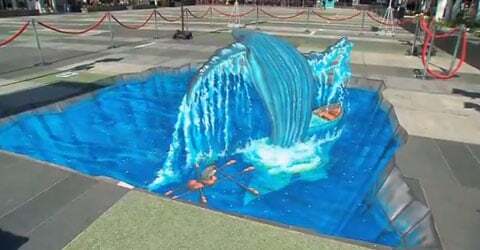 However, if you don’t live in the Los Angeles area, the above video segment gives fans a glimpse at the work it takes to create a large 3D sidewalk creation as well as gives viewers a chance to see the final draft of the design, which shows the whale jumping through some water in the middle of a jungle of concrete. Life of Pi was nominated for best picture at this year’s Oscars, however, prior to the award many people, Cinema Blend included, argued the picture should be lauded more for its visual effects than its overall achievement as a narrative. As far as a visual medium goes, there’s no better way to highlight the 3D effects of the film than with a 3D drawing. If you get the time to check it out in person over the next couple of days, I'd highly suggest doing so.